Historically, IT admins have been locked in to a single vendor platform for identity management. 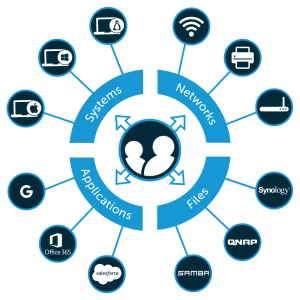 In this heterogeneous IT world we live in, single vendor platforms are limited by their identity management capability (they prefer to work with their vendor’s IT solutions), which in turn limits admins and their organizations. Now, with modern approaches to identity management, IT organizations can leverage whatever IT resources are best for them and still connect their users to those resources without friction. These modern approaches increase productivity and security while giving IT organizations more control over the IT infrastructure. A new generation of identity management solutions have embraced this modern approach, spearheaded by JumpCloud® Directory-as-a-Service®. Why JumpCloud for Identity Management? JumpCloud Directory-as-a-Service (DaaS) is a core directory service akin to the legacy Active Directory. What sets DaaS apart is that, since it is a third-party, cloud-based directory, it can federate user access virtually, regardless of location, platform, protocol, or provider. Offering identity management through the LDAP, SAML, and RADIUS protocols, JumpCloud can connect your end users to their systems, applications (on and off-prem), files, and networks with ease. To see what Directory-as-a-Service can do for your identity management situation, consider signing up for JumpCloud. Not only is signing up completely free and requires no credit card, but your first ten users are included to get you started. 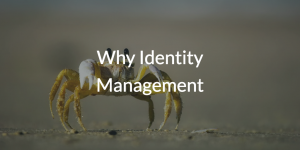 If you have any questions, you can schedule a demo to see the platform in action, or contact us to learn why identity management should be your first priority.